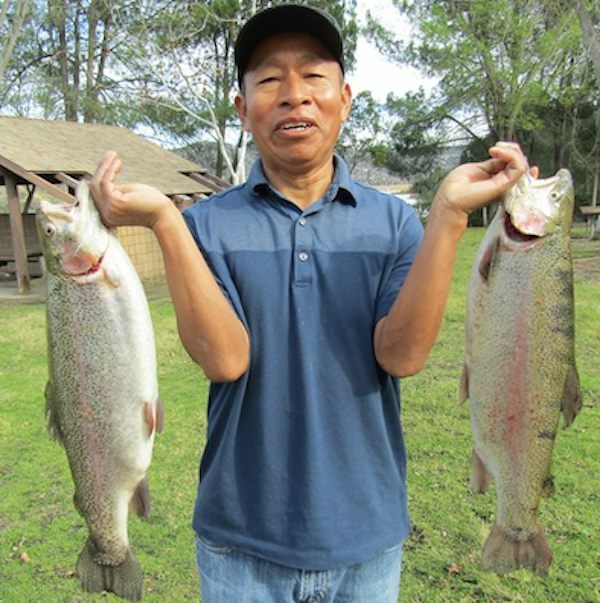 Raul Pizarro with two great looking Trout pulled in from the shoreline near the Buoy Line. Trout: In the early morning hours, you can round up a few trout in the shallow waters of Trout Cove and Boat Dock Cove. Although, it is the Buoy Line that you want to put your fishing emphasis on. With two stocks in two weeks, the fishing has been great! A two-pound test set up with a 12 to 18inch leader is recommended. Mini Jigs and Power Worms are being used for the aggressive morning bite while Garlic/Rainbow Power bait and Night Crawlers are the go-to bait when it slows down. Those on boats make sure to check out the Buoy Line if you find that the other areas are not producing well. We do suggest to start your shoreline fishing early as access to deeper water from the shoreline is limited. While fishing from the shoreline, it is recommended to go with the set up listed above. Our next pair of stocks are coming in February 13th and February 19th with a total of 3,000lbs. The Trout catching limit is 5! 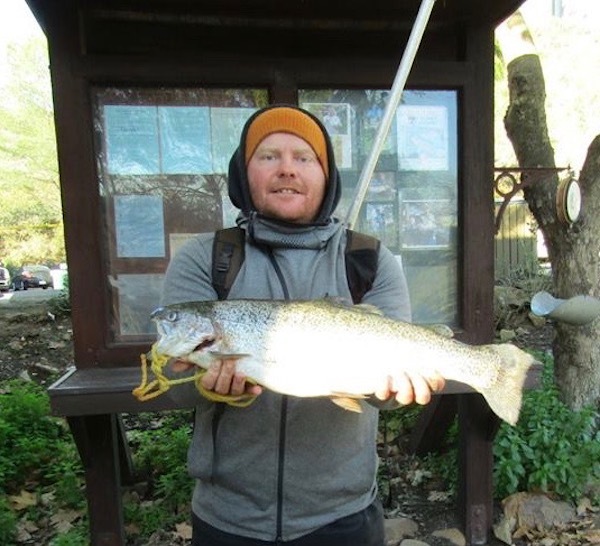 “No Catch & Release of Trout.” Matt McDevitt caught a nice 7.1lb Trout off of Pier 1 using a Smoke Mini Jig the day after our most recent stock. 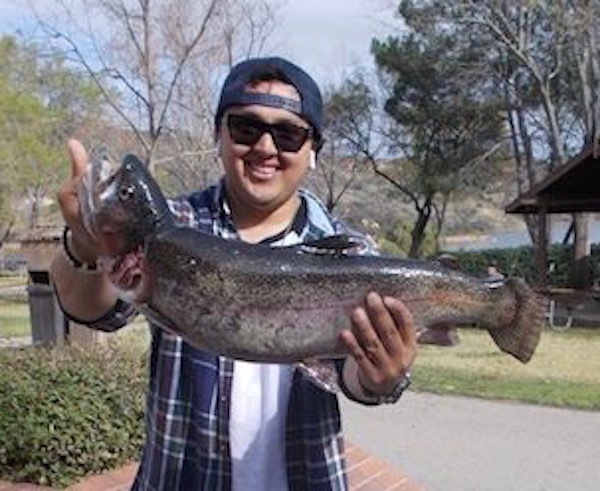 Raul Pizarro caught a pair of great looking Trout off of the shoreline near the Buoy Line using Garlic Powerbait. The Catfish bite has picked back up due to the rain and recent trout stocks. The productive areas have been Jack Creek Cove and the Buoy Line in the early morning and late afternoon before closing. Jason Pizzarusso broke our catfish record with an amazing 29lb 2oz monster just a few weeks ago. We have seen a healthy ratio of large catfish being brought in each week. Catfish have a limit of 5 at this time. At this time the Bass are active in search of food and are biting on drop shot and smaller swim baits. With the trout stock here it is a good time to practice different fishing techniques. Just a reminder, Bass must be at least 12 inches to keep with a limit of 2 at this time. Bluegill have slowed down and pushed into deeper waters. Mealworms, and cut up night crawlers have been good choices for catching Bluegill in the past few weeks with the majority of them being caught in the early morning and afternoon hours. The Buoy Line is producing large size fish at this time. Bluegill are limited to 25 of any size at this time.